A substantial detached stone farmhouse that has been significantly improved and extended over the recent years to offer exceptional family accommodation with high-quality fixtures and fittings throughout with the benefit of central heating and double glazing. Situated in a beautiful rural setting with long-distance views over surrounding farmland. Great equestrian facilities including recently constructed stable block and all weather ménage. The property is offered with the surrounding acreage extending to approximately 3.3 acres and a further 23 acres is available by separate negotiation. Traditional timber panel entrance door with double glazed side panel windows and curtesy top window. Double glazed timber windows to either elevations, tumbled edged travertine flooring with underfloor electric heating. Timber fitted wardrobes, curtesy lighting to ceiling. Useful under stairs storage area. Two piece suite comprising bracket wash hand basin with tiled splash backs, low level w.c, tumbled edge travertine flooring, high stand traditional cast radiator, double glazed upvc window to rear elevation, low voltage spotlighting. Beech ‘Parquet’ flooring, Clearview cast iron multi fuel stove set in recessed fireplace with raised stone flag hearth and stone mantle. Timber beamed ceiling. Double glazed upvc windows to front elevation. Three piece suite comprising wet room style shower with glass screen, pedestal wash hand basin set on chromed antique legs, low level w.c, ceramic tiled walls and floor, chromed radiator towel rail, extractor fan, double glazed upvc window to rear elevation. Airing cupboard containing cylinder and water filtration plant. Cast iron Clearview multi fuel stove in handmade brick fireplace with raised stone hearth and timber mantle. Beech ‘Parquet’ flooring, two high stand traditional radiators, double glazed timber French doors leading to front patio and garden areas. Double glazed timber bay window, four further double glazed timber windows to rear and gable elevations. Original timber beamed ceiling, kitchenette facility including fitted base units with single drainer stainless steel sink unit with mixer tap, built in microwave, ceramic hob and fridge freezer. Superb living kitchen with dining area. Range of high quality fitted kitchen furniture including island dining area. Black granite work surfaces, double enamel ‘Belfast’ sink with traditional antique style chromed mixer tap, built in fridge and freezer. ‘Rangemaster’ cooker with ceramic hobs. Oak boarded flooring, low voltage spotlighting to ceiling, double glazed upvc windows to front and rear elevation, timber stable door. Steps down from main kitchen area – Clearview cast iron multi fuel stove on raised stone hearth with double glazed windows to either side of flue. Oak boarded flooring, high stand traditional cast radiator, double glazed French doors leading to front patio and garden areas. Fitted base units with enamel ‘Belfast’ sink with chromed antique style mixer tap, black granite high drainer, ceramic tiled flooring, double glazed upvc window to rear elevation, curtesy lighting, plumbed for washing machine and dryer. Leading from kitchen – double glazed timber side stable door, high stand traditional radiator, oak boarded flooring. Double glazed upvc French doors to gable elevation, oak panelled flooring, single panel central heating radiator, low voltage spotlighting. Three piece suite comprising corner shower cubicle, bracket wash hand basin, low level w.c, tiled flooring, feature circular double glazed upvc side window and rear window. Chromed radiator towel rail, extractor fan, low voltage spotlighting. Superb garden room with feature glazed full wall corner window, timber boarded flooring, cast iron Clearview stove on raised stone hearth, double glazed timber window to gable elevation, high stand cast radiator, low voltage spotlighting. Dining area with Timber boarded flooring, double glazed timber French doors to front patios, high stand cast radiator. Timber boarded flooring, double glazed upvc window and French doors, single panel central heating radiator, range of fitted wardrobes. Open return landing with seating area, double glazed timber windows to front and inner gable elevations. Double glazed upvc window to front elevation, high stand traditional cast radiator, original timber beamed ceiling. Four piece suite comprising panelled bath, pedestal wash hand basin, low level w.c, fully tiled and screened shower cubicle, timber boarded flooring, timber ‘Velux’ skylight, double glazed upvc window to rear elevation, high stand traditional cast radiator, half-timbered walls. Double glazed upvc window to gable elevation, fitted wardrobes, single panel central heating radiator, and walk in wardrobe. Four piece suite comprising-panelled bath, pedestal wash hand basin, low level w.c, fully tiled shower cubicle, timber laminate flooring, double glazed upvc window to gable elevation. Feature double glazed skirting arched window and circular window, fitted wardrobes, single panel central heating radiator. Fully tiled shower cubicle, pedestal wash hand basin, low level w.c, timber ‘Velux’ skylight, timber laminate flooring, chromed radiator towel rail. Double glazed upvc window to front elevation, single panel central heating radiator. Double glazed twin windows to rear elevation, single panel central heating radiator, feature timbered wall. Four piece suite comprising – Jacuzzi spa jet bath, pedestal wash hand basin, low level w.c, fully tiled shower cubicle, ‘Velux’ skylight, double glazed feature round window to rear elevation, timber laminate flooring, chromed radiator towel rail. The property is approached from the main highway along a private stone road. Timber electrically operated entrance gates with security system, camera and intercom system. Pebbled driveway with ample parking areas. The majority of the garden areas sit to the front south elevation with attractive stone flagged patio and barbeque areas with formal borders and lawns. There is a further open garden and children’s play area with slide, swings and counter-sunk trampoline. Originally planning permission was obtained to erect a triple garage however the present owners have made a substantial stone built stable block offering three stables with separate feed and tack store. Light, power and water installed. Concrete, hard standing with separate tractor store. Recently installed exercise ménage with easy drain ‘Andrews Bowen’ high quality artificial surface with illumination. 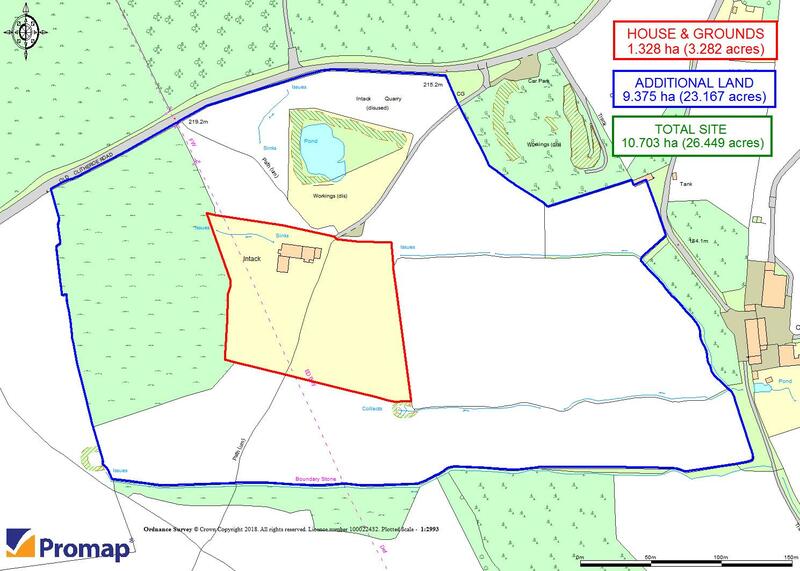 The property is being offered with the initial curtilage of land which extends to approx 3.3 acres. Additional land extending up to approx 23 acres available by separate negotiation. Mains electricity, mains water, oil fired central heating and domestic hot water.